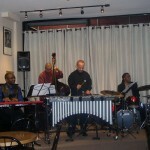 One of the world’s leading vibraphonists, Jay Hoggard, brought his stellar quartet to Sistas’ Place tonight. Band leaders in their own right, the Quartet features James Weidman, piano; Santi Debriano, Bass; and Yoron Israel, drums. 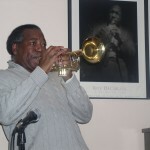 Trumpeter, Composer Ahmed Abdullah joins the ensemble in each set. Jay Hoggard began the set with a song from Guys and Dolls, followed by three of his own compostions each more lyrical and magical than the last. He paused in the middle of the set to explain his presence at Sistas Place in March, traditionally Women’s Month. He then took some time explain his connection to women without whom he observed, we would all be for naught. First , he gave tribute his mother Eva Stanton Hoggard who played piano and worked with Errol Garner and whose voicings or Errol’s music, Jay absorbed as a youngster. He also paid tribute to two pianists who were also vibraphonists who played with Terri Gibbs, both out of Detroit. One one Alice Mcloud soon to be Alice Coltrane and the other Terrie Pollard, a great vibraphonist now lost in the annals of history. At that point, Ahmed Abdullah who recorded with Jay ” a couple of years ago” aka 1979…. joined Jay on stage to play two songs, the second of which “Life’s Force” pushed the band into a whole other zone. The second set was equally stunning with Jay experimenting with some new songs and a lively version of Qhude by Ahmed Abdullah. For those of you who did not make it to Sistas Place on Friday, you have the rare treat of being able to hear this music first hand on Saturday night. For those of you who did , come out again to hear sheer genius at work and to have the opportunity to take home as an exit fee, a touch of that genius on his CD “Solar Power”.